This letter was written by Earl Thomas Reynolds, a lawyer in Coffeyville, Kansas, to Governor Fred Hall. 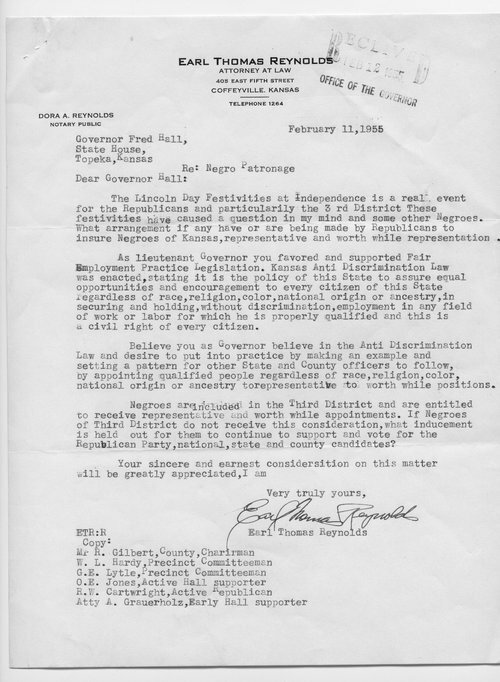 Reynolds was concerned that black people in Kansas were not receiving adequate patronage and political party representation in or by the Republican Party, particularly in the third district. Mr Reynolds inquired why should blacks continue to support the Republican Party, at all levels of government, if their support is not rewarded by the party.